The journey has started, and with a little luck I arrived in Kathmandu with my bags. This could be quite expected you might think, but when the Indian government is restricting fuel into Nepal, it causes chaos. Flights into Nepal were restricted, as such many passengers flights were cancelled or delayed. I was bumped from my flight from KL to KTM, however with a little persuasion, I boarded the correct flight and arrived in KTM on time. Considering the fact that I was "bumped" I certainly didn't expect bags. But interesting not only did my bags arrive, I did notice that there was a lot of spare luggage around the KTM airport, so many bags arrived independent of their owners. Many of the above items were purchased in both Nepalese and English as the students now have an English teacher are are taught English from primary school. We also managed to purchase a Laptop Computer and uniforms for all students. Sujan also had sorted out the travel arrangements and we can transport this gear in the plane when we leave tomorrow . When we arrive, local villages will take the gear to the school. 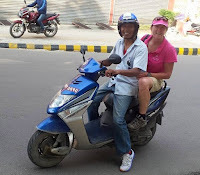 Following the shopping expedition, I met with Bikash and he took me on his scooter to his home to meet with wife, sister, sister inlaw, and baby boy . It was a lovely afternoon and he told me about his new house he is building outside of KTM. The house has 2 bedrooms and a kitchen and a small open plan area. After each trek, he saves the tips and income and buys more gear for his house. He had hoped his house would cost $600US to build however like all house budgets it has blown out to $1200. I gave him $100US to help towards the house. 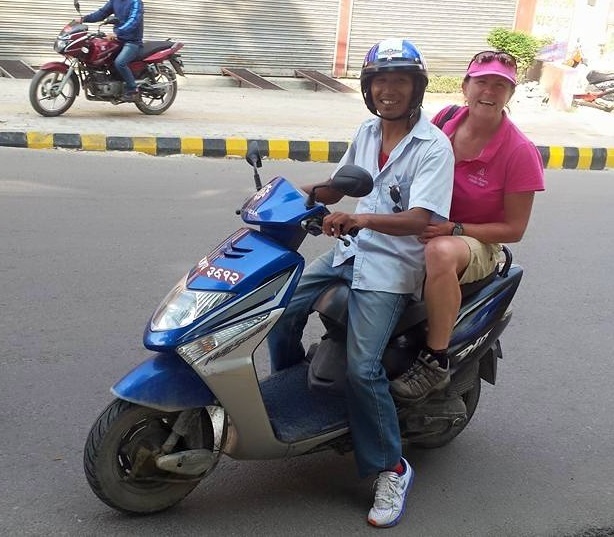 When I return to Nepal in April 2016, I look forward to visiting his new house and staying overnight. tourism is down and less people are here to trek than in previous year. The flight to Phaplu follows the same path as that to Lukla, the scenery is spectacular, the mountains in the distance majestic. Nepal is a beautiful place. We walk to our campsite ( our home for the next 5 days, about 2 hours walk from the airport. The porters have been there before us and 6 tents are erected , along with mess tent, kitchen tent and bathroom tent, as our new home. We settled in, then head to the school to meet the headmaster, the English teacher, kindergarten teacher, school council and many of the children. They are delighted to see us and shower us with a traditional welcoming ceremony, our necks are laden us with flowers and scarves. We hand out the gifts and do a site visit of the school. After the earthquake, the local community has created make shift shelters, 5 classrooms, that could possible hold 10 children each . Since the earthquake , other support has been given to the school, new toilets and a water fountain have been established and uniforms were donated for 12 out of the 60 students. Day one of our working bee has started. Yesterday when we visited the school, we thought our job was to lay the foundation, however, with a large slab on the ground, we realised we had some hard labour to do . much can be done with a systematic effort . We should achieve a lot by the time our 5 days is over. Back to work today , the mornings start beautiful , sunny but not too hot. We had less local workers today, so we didn't move as fast, amazing what 6 more people can achieve. Our morning was primarily digging trenches. The engineer visited the site and showed us the plans , from which we could now see where we needed to dig holes and how deep the trenches and holes need to be . It is great to see what some $$ and some hard effort can achieve for a little community. During lunch a big thunderstorm came upon us, and we got to have another 2hours break. The afternoon saw the completion of the trenches and the levelling of the site . There are 12x 4'4" holes we need to dig tomorrow , it will be interesting to see what else we achieve . So an overall nice crew, lots of mixed experience, everyone however has a big heart and are very keen on giving to the school. Dave has bought 200pound as a donation, Simon $750 AUD , and Isobel has been fundraising for the WEF by holding a gig in newscastle before she left and also running a raffle . We have decided to amend the itinerary slightly , by bypassing Junbesi, we can have a rest day in Namche, which is a good idea as a day walk around Namche is a really lovely thing to do with so much to see. It means when we leave Luru, we head straight to Taksinendo. A nepales flat 5 hour walk. We are all happy about that , and Sujan is ensuring we see the very best of Nepal , and hence slightly adjusting the itinerary. Building was not so productive this morning. We browsed the plans and thought we would concentrate on digging the main pole holes, which are to be 4'4" deep, 12 in total. The rest of the foundation is about 2'6". Alas the Nepalese leader, I think, wants the entire foundations to be 4'4".. Which is a lot of unnecessary digging and removing of dirt . As the morning progressed so did the development of the foundation, we moved into to digging the key post holes, by lunch at least 5 of the holes had been started and 3completely finished. Several of our crew have come down sick. So quiet a few less hands on the worksite today. a stroll into town to buy some extra supplies for us , it would take us 2 hours each way , I think it took him 1 hour return . Just love the way nepalese walk. Tomorrow will be a rest day from the worksite . One of the local villages recently past away and here is a celebration for him tomorrow, so no one in the village works,and it would be rude for us to . Sujan has a pleasant day planned for us seeing the local monastery and playing respect to the grieving family. It appears most of the team are now coming down quiet sick. James and Brooke from early morning, then Stephen and Simon once we got back to site. By night fall I had another bout and so did Richard , 6 out of 11 sick .. Something has happened. Maybe some food poisoning. I spoke to sujan to ensure the kitchen staff are thoroughly preparing the food and ensuring cleanliness . We too are being more careful . This is effectively a rest day, probably not a bad idea considering so many people not feeling well.We started the day by walking to the monastery, which was a lovely stroll. The monastery was effected by the earthquake and is being rebuilt and repainted. The views from the top are lovely, the first site of snow capped mountains is always a beautiful thing in Nepal. An afternoon of sleeping, reading, blogging and chatting . Back to work we go :)... The last morning of hard labour ! We finished all the foundation trench work. 10 x 4'4" holes were completed. These were not an easy task , (a) much of the ground was filled with shale / hard rock, so digging was difficult through such terrain;(b) once you got 3 foot deep it was getting harder to shovel the dirt out of the hole ... Quite a long way to throw the dirt. Well it was finished , ready for the next group to come. They prepared a plaque and placed our names on the wall of the school to say we helped rebuild manju shree primary school. After lunch there was a village celebration, we returned to the school with the local villagers, school teachers, school council , and children and were presented with more scarves ,and flowers, plus chocy biscuits , coke and cornwine . The headmaster gave a thank you speech to us , which was followed by the local villages performing a thamel/Sherpa traditional dance and two girls from the school doing a modern routine . Post this, music was played and we all danced together . It was a lovely celebration and it had been an absolute delight to have helped rebuild this school. It's now time to think about tomorrow. Tomorrow the trek starts. It's time now to prepare the bags and get our rooms ready for packing. Very excited to start the trek and see more of the Nepalese valleys.